The past few seasons have seen the Pacers make the steady progression that the Oklahoma City Thunder are known for. In 2010 they made the playoffs for the first time since 2006, defeating the Top seeded Bulls. The following year they took the eventual champions, the Miami Heat to a 6 game series in the 2nd round of the playoffs. Last year, they took the eventual champions Miami Heat to a 7 game series in the Eastern Conference Finals. Their starting lineup is gold. 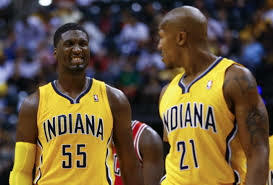 Roy Hibbert and David West are no nonsense, grind it out defenders that protect the paint, and can also score. Paul George is quickly establishing himself as one of the best two way players in the entire league. George Hill provides stability at the helm of the offense, he can score, pass, and most importantly defend. The last starting lineup spot goes to either Danny Granger or Lance Stephenson. Coach Frank Vogel can’t go wrong with either pick. The Pacers have arguably one of the deepest benches in the league, capable of playing offense and defense. The focus of the offense on the bench will either be Danny Granger, or Lance Stephenson. Personally, I’m more in favor of Danny Granger coming off the bench, but that’s up to Frank Vogel. They made positive steps this offseason by signing Luis Scola, C.J Watson and Chris Copeland. Luis Scola has always been an efficient player. C.J Watson is a good defender, a decent scorer and a capable backup. Chris Copeland can provide instant offense in a pinch, play solid defense and rebound. The Pacers bench is excellent, a mixture of good defense and offense that will take the Pacers where they want to go.